Taiwanese garden tool makers ride market trends by launching different products that meet ever-changing demand. Bolstered by consummate production capability and ample practices, Taiwan's garden tool manufacturers have enjoyed a prominent status in the global market for some years. Some of them even stand taller than most peers because of their strong concentration on R&D driven by market trends. As global economic fluctuations, social changes and technology advancement have gradually changed consumer behavior and preference, garden tools have been lighter, eco-friendlier and more multifunctional, so that meet needs of increasingly price-sensitive consumers and female and elder DIY users, as well as fuzzy professionals for different purposes. Understanding electric garden tools that are comparatively effortless and eco-friendly will lead the market as populations in developed countries are constantly aging, while more and more women work on backyard gardening, Jiin Haur Industrial Co., Ltd., one of Taiwan's best-known suppliers of garden cutting tools, has worked out its JH-29 electric grass cutter to adapt to the market trend. The company's president Neil Wu noted that his company is inspired to develop the tool mainly by growing market demand for improvements of traditional grass cutters that are generally built with gas-fed engines so noisy and heavy, therefore unsuitable to female and elder users. Plus, he went on to say, conventional models are mostly without safety designs, so causing serious injuries to incautious users during operation very easily. For enhanced safety and utility, Wu furthered, the grass cutter is specially designed with not just a safety lock on the handle, but also the so-called weed stuck plate and protection plate near the blades that are easily replaceable and available in two materials, SK5 steel and strengthened nylon. The weed stuck plate has a sun-like shape for holding long-growing weeds for easier cutting, while the protection plate is a fan-shaped cover alongside the blades, used to keep users away from danger caused by rotating blades and crushed stones. Plus, the motor is housed with heat-resistant plastic coupled with a ventilation outlet, and the tube undergoes special anodizing treatment to greatly enhance electrical safety. Founded in 1977 in Taiwan's central county of Changhua, Jiin Haur has been devoted to production of garden cutters, noted for its time-tested OEM (original equipment manufacturing) and ODM (original design manufacturing) capability. The veteran manufacturer's current achievement is built on its R&D competency. With advanced computer technologies, such as AutoCad, UG and Solidwork, and accumulated knowledge of markets and garden tools, the company can release 10 to 15 new models every year to help customers achieve bigger market shares. Following decades of development, Jiin Haur is today Taiwan's biggest maker of garden cutters, with monthly output of 450,000 units of various products. The company's available product portfolio comprehends a variety of long-reach pruners, pruning shears, grass shears, tool racks, drop-forged pruners, razors, scissors, and battery-powered motorized shears and cordless screwdrivers, which are all certificated by GS, VDE, UL, and CE standards. Presently, 35% of the supplier's products go to the U.S., 50% to Europe and the remainder to other countries of the world, with some under its owned Praise brand. Globally known brands, including Corona, Costco, Fiskars Brand, Wal-Mart, Target, Lowe's, Shears, Bauhaus, etc., are on its customer list. Also inspired by growing eco-protection concerns all over the world, Lu Shyong Machinery Industry Co., Ltd., a supplier of pumps and garden cutting tools, launched its Eco Rechargeable Long Reach Hedge Trimmer to ride the wave. The company's manager K.C. 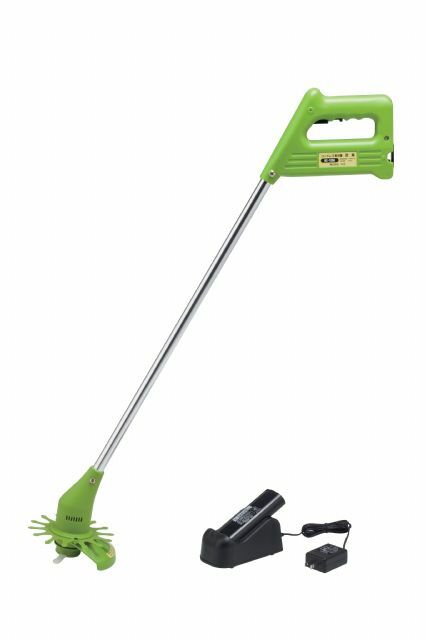 Lin introduced that the trimmer is powered by a rechargeable batter in a pack with ergonomically designed shoulder belts, and adopts a high performance motor. The pole is telescopic and can be extended up to 3 meters for easier cutting of twigs and branches. Besides, Lin said, the pole features a patented structural design, and the battery is built with a special electronic control unit, both giving the trimmer a longer lifespan. “This tool has been heavily ordered by a European customer for trimming olive trees, and its excellent features, including low noise, easy operation, stability, safety and effortlessness, prove helpful to enhance working efficiency,” says Lin, adding that the product that offers battery options of lead acid and lithium models is suitable for gardening and fruit farm and landscape management. As a specialized supplier of pumps, the company also applied its expertise to work out Hot Water Series cleaning machines. Lin emphasized that factory and workshop cleaning using hot water has been common in Europe and the U.S., but not in Southeast Asia mainly for a climate reason. “In fact, using hot water to clean greasy instruments and restaurant floors, and to wash cars is more efficient and helpful for sterilization,” stresses Lin, saying that Lu Shyong, which is focused mostly in the Southeast Asian market, decided to launch such cleaning machines as the frontrunner in Taiwan to pioneer exploiting growth potential of the segment in Southeast Asia. The cleaning machine is built with the company's high-end pump with a high quality ceramic plunger and ceramic bypass valve, as well as a vertical stainless steel boiler supplied by its Italian partner. The cleaning machine is designed with a total stop system that is composed of a spray gun control, safety pressure switch, overload valve, etc., and can automatically shut down either the pump or the boiler in case of malfunctions. With a high capacity 14-liter tank and a 6-liter detergent tank, as well as heavy-duty antirust plastic vessel base and four heavy-duty plastic wheels, the machine has excellent mobility and high utility. With more than 20 years of experience, Lu Shyong, sited in Taiwan's central city of Taichung, has supplied various pumps for agricultural equipment and cleaning machines and related accessories with ISO 9000 and 9001 certificates. The company's global competitiveness is mainly driven by its professionalism in aluminum die casting and CNC machining, that enables it to independently develop and produce a wide range of agricultural and gardening equipment, including power sprayers, knapsack sprayers, sprayers with built-in rechargeable batteries, portable power sprayers, high-pressure cleaning machines, high-pressure industrial pumps, fogging machines, air coolers, diaphragm pumps, brush cutters, power tillers, spray guns, washing guns, nozzles, pullers, hose reels, hoses, extension rods, and twirl preventers. Lin went on to say that to survive the increasingly competitive market, Taiwanese companies must be more concentrated on R&D and market trends, so carving out its niches by supplying unique, marketable products, instead of competing on pricing against emerging rivals. “Therefore, Lu Shyong emphasizes speedy, market-leading R&D, and is undaunted to explore uncharted territories,” states Lin. Following years of concentration on the Asian market, he revealed that his company will switch the focus to East Europe and Africa in the years to come, where market potential of agricultural equipment is even more tremendous than expected. Since bio-sourced plastic that is degradable to harm little the environment has been increasingly a buzzword among global manufacturing industries, Chin Kuei Co., Ltd., a seasoned maker and exporter of gardening materials, such as flowerpots, wall pots, nursery pots, flower pans, nursery frames, pot holders, trolleys, etc., has been dedicated to developing various gardening products of bio-sourced materials. Chin Kuei's director Christy Chang indicated that prompted by market trends, her company has worked out a series of plant pots and related containers made of corn starch and eco-friendly plastic. Featuring vivid colors and high durability, some of such products have been adopted by domestic large-sized food service providers and flower growers. “Chin Kuei mostly uses PP (polypropylene) and recycled plastics in production, and recently tries to apply different eco-friendly materials to develop new products, in efforts to provide customers the most diverse possible product lineup to meet end-users' demand,” says Chang, who added that her company conducts R&D mainly based on market observations. Since founded in 1989 in Miaoli County, central Taiwan, Chang claimed, the company has steadily grown into one of the leading gardening material suppliers in Taiwan, and marketed its products under an owned brand at home and abroad. Today, the company's products trademarked with the abbreviation of CK have been distributed worldwide. To say that Chin Kuei's current success is primarily built on its keen sensitiveness to market pulse along with ample know-how is not overstated. The company in fact began by engaging in plastic blow molding to supply medical products as urine collection containers, and a few years later resolved to transform into plastic injection molding to venture into the gardening materials segment that was just about to take off at that time. More notable was that, Chang stated, Taiwanese plant growers started moving from northern regions to the central at that time because of wilder climates there. The height of the immigration further contributed to agricultural development in central Taiwan, boosting Chang's confidence of her new business then. In a view of continuing growth, Chang confirmed that the company considers setting up a logistic warehouse in Taiwan Orchid Plantation, an industrial park situated in Tainan, southern Taiwan for orchid growers, this year. Since Taiwan is globally reputed for its domestically grown orchid, which can match that from the Netherlands and has been one of Chin Kuei's sources of growth drivers, Chang says, “Running a logistic warehouse there can further fuel our company's business for sure.” With strong manufacturing and marketing capabilities, Chin Kuei is moving toward its goal of becoming world's top-caliber supplier of gardening materials.